Previous winners and contenders are contacted and asked if they wish to be nominated this year. Press releases are circulated to travel trade media inviting companies to nominate. 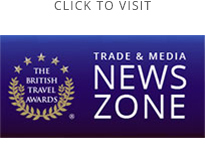 Trade media partner - TravelMole announce that nominations are open across their online newsletters. Nomination applications are checked to confirm they meet the awards criteria and appropriate positioning within the categories. Nominees registration remittance must be received by 14th June to ensure category listing on the voting form. Nominated companies’ blog articles and video content feature in our weekly online newspaper BTA Connect. The 13 weeks voting cycle opens with the online voting form and TravelVision 2020 survey published on britishtravelawards.com website. Up to four sponsored e-newsletters are sent to over 500,000 past consumer voters; inviting them to participate, with updates on the awards and featuring contents of the prize draw incentive. Our database of over 500,000 (GDPR confirmed) subscribed past voters is not shared or sold to any third parties. E-newsletter sponsorship enables sponsor to directly engage with our audience of regular travel consumers. Nominated companies’ blog articles and video content content feature in our weekly online newspaper BTA Connect. Nominees lobby their customers for votes via their websites, communication channels and news articles submitted by them to local media outlets. Throughout the voting cycle our checks and balances software queries the voter database searching for voting anomalies. Possible incidents are flagged and reports generated for investigation and referral to Deloitte when voting closes. Voting closes at 23:59 on Monday 30th September. Any votes recorded after that time will not be included in the final count. Work commences on determining this year’s winners and preparation get under way for the awards night ceremony. The raw voting data together with voting analysis and supporting reports are submitted to Deloitte for verification. … Most anticipated event in the travel industry calendar! The British Travel Awards gala presentation night will be returning to Battersea Evolution, London on Wednesday 27th November. Details of winning companies are published on britishtravelawards.com website and promoted across social media networks. Award winner logos available to download from unique link emailed to each successful company. Winning companies’ blog articles and video content will feature in our weekly online newspaper BTA Connect until the end of March 2020.